People are always amazed when I take the time to make anything from scratch, such as brownies, cakes or even crackers. The assumption is it takes too long or is just too cumbersome. I’ll admit baking from a box seemed the norm for me when I first learned to bake. Then I realized that baking from scratch was easy and it actually tastes a lot better. While there is nothing wrong with opting for the ease of a box cake, brownie mix, or even mass produced crackers, there is also no harm in testing your skills with a few scratch recipes. Since then, I have learned to make many things from scratch. Now, cookies, cakes and brownies are easier and of course make more sense, but why not try crackers. A while ago, I decided to give them a shot. I made Parmesan crisps then and decided to try spicy cheddar crackers this weekend. And wow! They are amazing! The recipe is super easy. It only has six ingredients and requires just a few tools. In a food processor, combine first five ingredients and pulse until the mixture forms crumbles. Then add the liquid and pulse until a ball forms. In some cases a ball won’t form but the dough becomes wet enough to form a ball by molding it with clean hands. On a floured cutting board with a floured rolling pin, roll out the dough into a 1/8th inch thickness. Then, using a small biscuit cutter, cut out as many small rounds as will fit. Lift the rounds carefully and place onto a cookie sheet lined with parchment paper. Bake at 350 for 12-15 minutes. 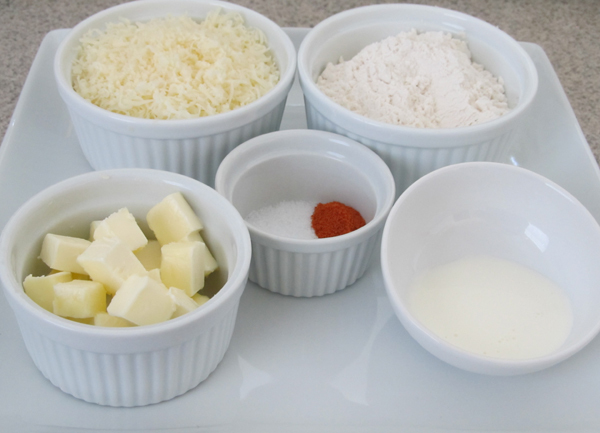 I found the recipe on the blog Smitten Kitchen, and it was originally for cheese straws. I altered it just a little, replacing the red pepper flakes with cayenne pepper and cut them into a cracker rather than into strips. You can use any spice you’d like with these. I’ve used onion powder and garlic powder on occasion. I’ve also changed up the cheese and used a Monterrey Jack or Colby. This can also be made gluten free with a small tweak. Instead of rolling the dough out and using a small biscuit cutter, wrap the dough in plastic wrap form a log with it and chill overnight. You can then cut rounds and and bake for 12-15 minutes on 350. I’ve baked these up many times and each time they don’t last long. Kevin gives them a rave reviews every time, commenting that the cayenne gave it a little kick of intense flavor. If you can make pie dough from scratch, then this is a piece of cake. Actually, it is easier then pie dough and only took me 30 minutes from start to finish. If you want to impress your friends, whip up a batch of these for the next book club.